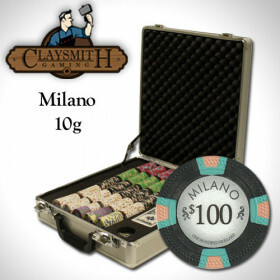 This handy set features 300 Milano 10g poker chips in a custom Claysmith Gaming aluminum storage case. 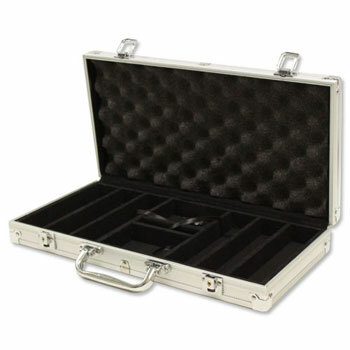 The case includes 3 removable plastic chip trays that will keep your chips neat and organized. 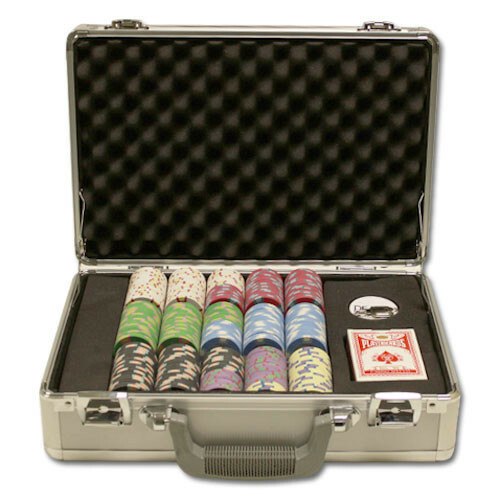 The chips are some of the highest quality poker chips available for home use. 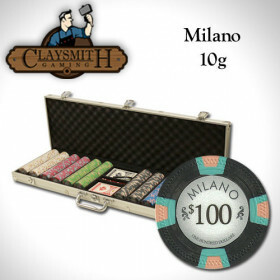 300 Claysmith Milano clay composite poker chips in a custom aluminum storage case. We'll also include a free deck of playing cards and dealer button to get the fun started.. 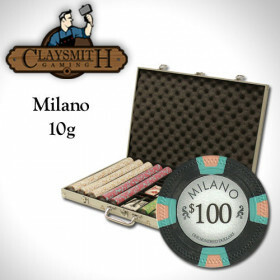 The Claysmith Milano 10g clay composite poker chip is by far one of our favorites. 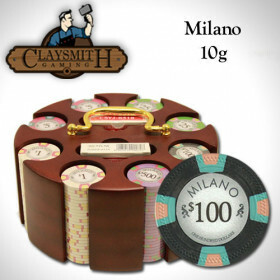 This poker chip not only looks fantastic, it come in a light weight 10 grams, which is actually closer to the true weight of a casino poker chip than many people realize. With one of these sets, your home game will instantly be upgraded to a true home casino experience. These chips look great, feel great and play great. 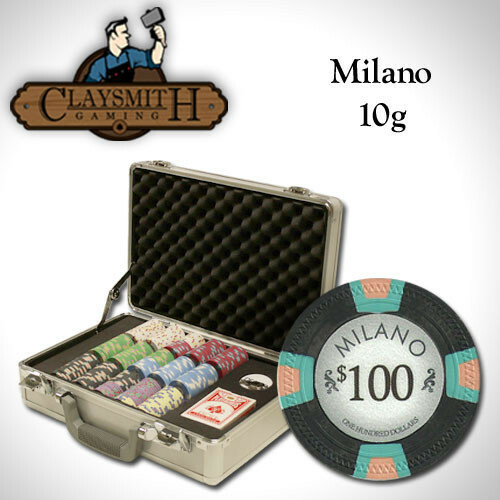 You can find out more about how these Claysmith Gaming Poker Chips are made. The chip is true casino quality, using compression molding techniques to get that professional look and feel. 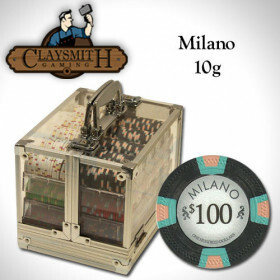 The stylish Milano inlay is set upon Claysmtih Gaming's "stitch and line" poker chip mold. The chip provides intricate mold details not found in most home grade poker chips, and sets this poker chip above the crowd. 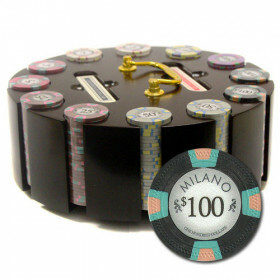 The unique edge spots feature outer and inner trapezoids along four sides to give the chips a professional casino look. 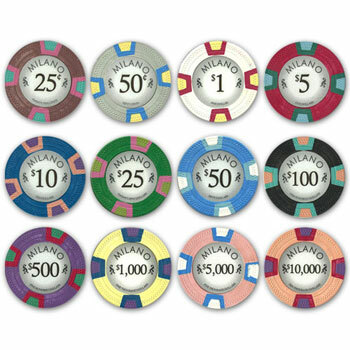 The design is based off the Bellagio poker room chips and is a very popular design. The inlay is clean and regal and lets all of your players know they are playing at the best game in town. Upgrade your home game with a high quality set of poker chips today!